Technologies like Augmented Reality, that enrich the standard methods of imparting education are always in demand, now more than ever. The newer methods of teaching enable post-session content accessibility, contextual relevancy, personal attention, up to date courseware. A big disadvantage of using the traditional Instructor-led classroom is its inability to address individual learner needs, leading to a lack of attention and interest among students. This is where modern technologies like Augmented Reality come in. AR, VR, MR are technologies which provide visuals to learners that can enrich the learning experience and assist the educators in creating content that links visuals to reality. For educators, technologies like this offer a method of delivering content that makes learning interesting and easier to understand. Augmented reality is a technology with which one can enhance reality by adding a layer of information which is superimposed over the actual visuals. This layer of computer-generated images is visible when one points their device camera at specific points. This action displays a visual that enhances learning with better visual and sensory experience. To put it simply, users see layers of digital information covering real-world images, which can improve their experience and understanding of reality. Location-based AR: This technology displays information based on a device’s geo-location. Projection-based AR: In this case, AR software sends light to an object which creates an interactive dashboard in a real environment. Superimposition-based AR: This type of AR allows users to replace the actual image, adding new elements to the viewpoint. So, if a student scans the AR-enabled content with an AR application on their device, they will be able to view all visuals linked to the concepts in their courseware. The AR and VR market is expected to reach a market size of $215 billion within 3 years. The number of AR and VR users is expected to cross the 1 Billion mark by 2020. What are the Advantages of using Augmented Reality technology in Education? Interactive courseware results in increased involvement with learners since they can access engaging content from their smartphones. Users need to scan the content through their devices to view a computer-generated visual which leads to better understanding of a concept along with some links to digital assets that can provide additional information. Augmented Reality in education can entice learners to access the courseware due to its enriched experience. Creating, updating and distributing printed courseware along with related support props to enable learning in traditional setups is a big investment for institutions. Whereas integrating Augmented Reality in education allows cheaper and easier creation, alteration and deployment of digital content where almost negligible print costs are incurred; AR-enabled content and all its visuals can be viewed on a reader’s device itself allowing BYOD scenario. Hence, improving ROI for institutions as well as the publishers. Content in physical books is restricted to text and images that only allow learners to view the images and assume how an equipment functions. 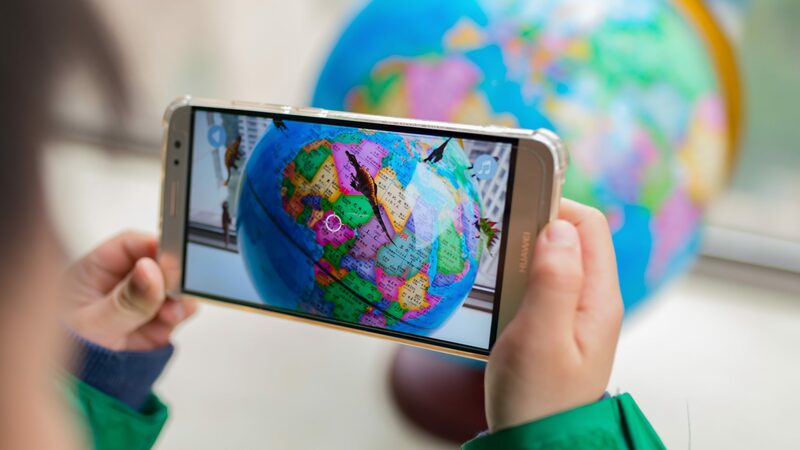 Whereas integrating augmented reality in education enables the course creator to take advantage of the technology at hand to create and deploy 3D visuals that interactive to user’s touch. This provides contextual relevancy and leaves no space for assumption because the educator can display how equipment functions in real life. Is Augmented Reality technology Really the future of Education? The education system all over the world was only following traditional instructor-led teaching approach. Integrating technologies can enrich and bring in benefits for educational institutions, educators as well as learners enriching the entire learning experience. Specifically talking about integrating Augmented Reality in education, it can lend many benefits, like motivating students to learn, transforming classrooms and learning methods with interactivity or supporting students learn faster and retain better. The attention span of humans has dramatically fallen over the years, in scenarios like these technology-assisted learning can in some cases address the issue. Along with technologies like Virtual Reality, Mixed Reality, Augmented Reality can collectively change the traditional learning methods by enriching the experience. Augmented reality cannot singularly address each and every issue with traditional learning methods to redefine the future of education. Educational institutions, publishers should be agile enough to identify the disruptors and accordingly strategize to carve out a competitive advantage for themselves by offering a better experience to end users. Partnering with innovative and technology-driven digital content transformation, eLearning, and digital publishing organizations can assist publishers and institutions to deliver robust learning experiences assisted by technologies like AR, VR and the like.